The Last Runaway by Tracy Chevalier. Publisher: Dutton (January 2013). Historical fiction. Hardcover. 303 pages. ISBN: 978-0525952992. 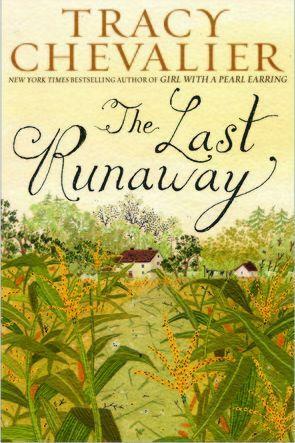 When I first started reading The Last Runaway, it seemed strange that Honor Bright chose to accompany her sister from England to Ohio. Why would she emigrate from England without any set plan of her own? Who was living in Ohio at this time? What was going on there? Her sister’s betrothed to another Quaker from their small town. Apparently lots of Quakers moved to Ohio from North Carolina in opposition to slavery. That’s one thing I learned from the novel. After a horrific voyage, Honor sister falls ill with yellow fever and dies on their voyage from New York to Ohio. Not knowing what else to do, Honor continues on to Faithwell as planned, making a short stopover in Wellington at the insistence of a kind woman named Belle who puts Honor to work in her milliner shop once she discovers Honor’s quilting skills. We find out much more about the colorful, outspoken Belle as her friendship with Honor gradually grows. Belle’s brother, Donovan, is a slave hunter. The two siblings couldn’t be more dissimilar. He startled and intrigued Honor when he stopped the man who’d offered to give Honor a ride to search his carriage for runaway slaves. As Honor settles in her new home, author Tracy Chevalier reveals the Underground Railroad which traversed through Ohio as slaves sought freedom far north in Canada. Many Quakers became a vital part of the Underground Railroad movement. She fails to provide complete details but gives bits and pieces as seen through Honor’s association with the movement. As Honor learns about the Underground Railroad in Ohio and near Oberlin, so too does the reader. In Faithwell, Honor quickly realizes she can’t stay with her sister’s intended, Adam Cox, and must find her own way—which means marrying a Quaker. Honor discovers the vast differences between England and the Midwest—not merely the landscape but the customs and the people. Much more rugged, dirty, open. Fewer gardens and manners. Outspoken people. Different customs and foods. American quilting seems a bit inferior. They applique while Honor makes quilts using paper templates. Honor’s attachment and dedication to quilting serves as a focal point throughout the novel. Certain quilts hold special meaning to her. She travels to the States with a signature quilt made by those in her village. Chevalier takes great care to provide detail about quilting at this time. The novel would’ve been stronger with more information about the Quaker traditions. Why did they need a certain number of quilts before getting married? Why do Quakers dress so plainly? Honor soon marries a kind farmer named Jack Haymaker. Unfortunately her new mother-in-law isn’t the easiest woman to get along with and the more comfortable Honor grows in her new home, the more she tests her family and her voice. Honor stumbles into her activism with the Underground Railroad. One day she happens upon a runaway slave hiding outside when she’s sick. Being a good Quaker, she knows she’s to help this person in need. She knows it’s the right thing to do. She helps that person and ends up being scolded by both Donovan, the slave hunter, and her own husband. She’s quite confused knowing that the Quakers are opposed to slavery. Through her own research in town she starts to leave food out for the slaves passing through until her husband finally confronts her and tells her that she jeopardizing her family. He tells her it’s against the law to assist runaway slaves. Once she’s pregnant she must stop doing so. Honor refuses based on her Quaker principles and runs away to Belle’s. Eventually she returns and takes an oath of silence as her husband won’t let her do what she feels in her soul is the right thing to do and she feels he’s only preventing her from helping those in need due to money. It’s a rather awkward time for the couple and Honor’s not sure if their marriage will survive.